Friday, September 18, 2015 was a beautiful day in Walnut Creek to hang out at a PARK. 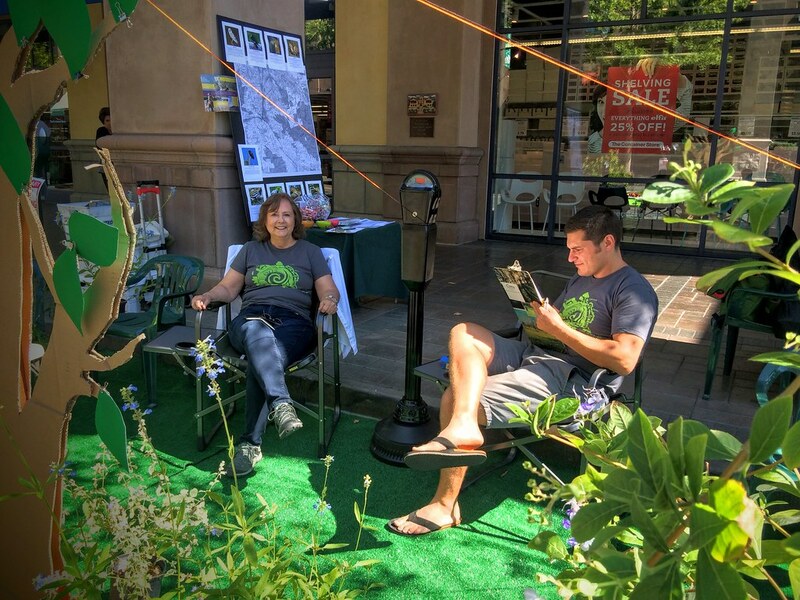 Last week, Greenbelt Alliance joined the global event PARK(ing) Day by “providing temporary public open space… one parking spot at at time.” We transformed four metered parking spaces in downtown Walnut Creek into fun and educational places for people to slow down, take a break, and enjoy the neighborhood in a different way than they’re used to. Coloring books with red-tailed hawks and mountain lions? Check. Lounge chairs and maple cookies? Check. Walnut Creek, we had a blast. And we look forward to doing it again next year! Thank you to Regional Parking Inc. for lending us your parking meters. Interested in exploring parks that are bigger than a parking space? Check out our free weekend outings at greenbelt.org/events. For more information about our work in Walnut Creek, contact Joel Devalcourt at 510-306-4203 or jdevalcourt@greenbelt.org.